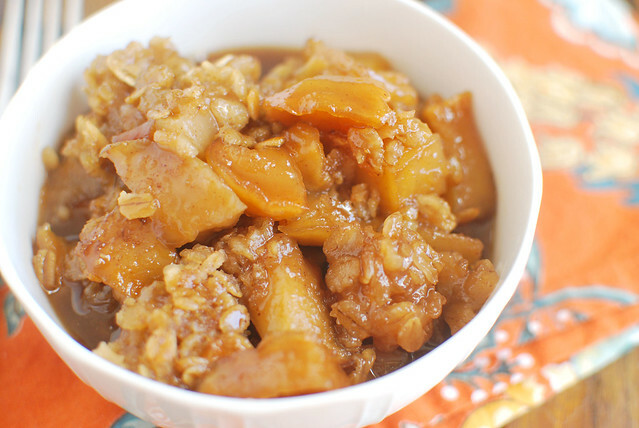 Slow Cooker Caramel Apple Crumble is a delicious fall dessert recipe! Cinnamon apples topped with a crumbly oat mixture – and it’s made in the crockpot so it is super simple! Many apologies for being absent lately. I’m sure I mentioned that my husband has been in and out of the field all month and every time he comes home, we all get sick. And by “we all” I mean the baby and I. Because that’s just the kind of luck we have. I figured I’d update you on the exciting things that have happened since my last post. Most of it is about the dogs. You’re welcome. I bought my first ever jar of Nutella on Wednesday and it was gone by Friday night. Funny thing is, I’ve never bought it before because I “don’t like” chocolate and was convinced that I would hate Nutella. Nicole made a S’Mores Frappe to commemorate the one year anniversary of S’Mores Week. I was supposed to make a S’Mores Shake but I was sick and then, umm… I ate all the Nutella that I bought for it. The other day, on the way to the dog park, Clementine jumped out the window of the car. Now, I’m a responsible pet owner mom and I only open the windows halfway because I knew she would try that one day but she is craftier than I thought and now she’s not allowed to hang her face out the window. Thank goodness I’m also a strict speed limit follower and was only going 30 MPH. And double thank goodness that it was the weekend so the streets on post were dead. Because you know she just stood in the middle of the street after she did it. Slow Cooker Caramel Apple Crumble! In unrelated news, I am in full-on fall mode. I’m checking the mountains every day for snow. I’m checking out Halloween costumes. I definitely plan on holding off on pumpkin until the Annual Food Bloggers Must Post Pumpkin Recipes Day (October 1) but I figured it’s never too early for apples! 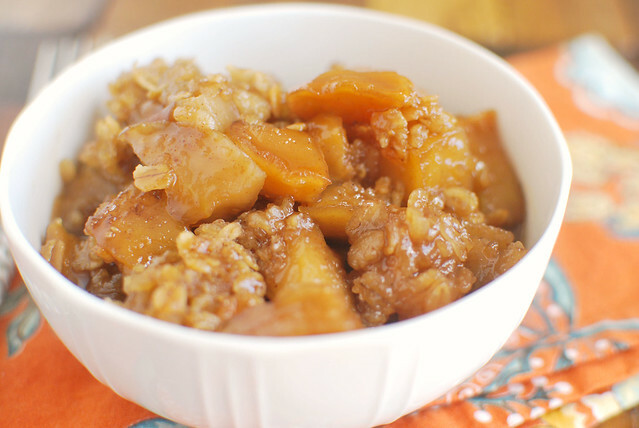 This Slow Cooker Caramel Apple Crumble is one of my favorite fall recipes! 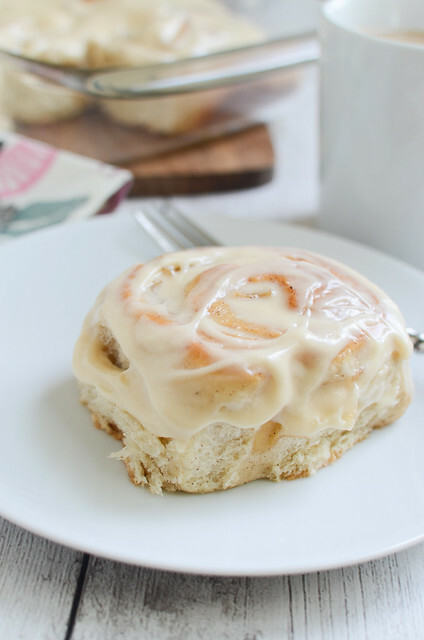 I love a crockpot dessert and this one couldn’t be any simpler. I’m willing to bet that you already have ever single ingredient in your kitchen so now you just have to put it all together in your slow cooker and let it work it’s magic. I love making this one for the parties we host during football season because it’s hands off and it’s always such a hit! The sugars turn into the caramel when they’re cooked down! And since it’s both brown sugar and granulated sugar, it’s a super rich, super delicious caramel that coats the apples perfectly. In a mixing bowl, combine brown sugar, granulated sugar, apples, salt, and cinnamon. Spread onto bottom of slow cooker. Mix your crumble topping ingredients until it comes together. Sprinkle it over top of the apples. Cook on low for 4 hours, or high for 2 hours. Turn off heat and let sit, covered, for one hour to let the caramel thicken. 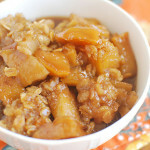 43 Responses to "Slow Cooker Caramel Apple Crumble"
well i broke the oct 1st rule today!! ha!! Basically drooled all over the computer screen trying to press the “print” button on this recipe. I require large portions of Apple Crumble. This looks absolutely delicious! I bought Nutella this year for the first time and I’ve used it in baking so much. I never bought it before because I figured I’d eat it all. I was right. 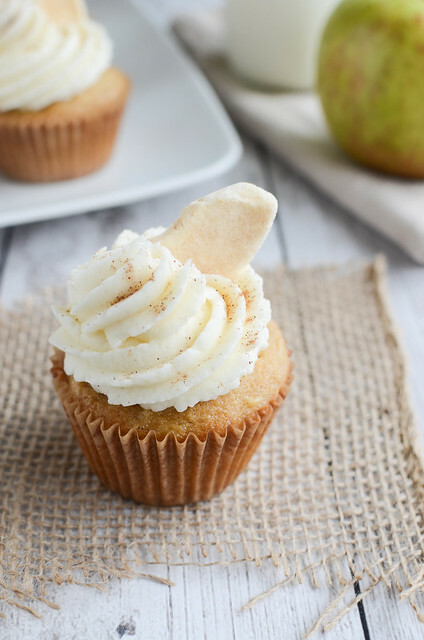 This looks so comforting and the perfect dessert for fall! I just got a ton of apples from my neighbor and this would be the perfect way to use some of them up! THIS looks amazing. So perfect for Fall and I cannot wait to try this next month!! Totally pinning! We like Apple Crumble -thanks for the recipe! Sorry you guys all got sick! Love that you used your slow cooker for this. I made an apple crumble today that I’m going to post next week. No slow cooker though! I can relate, I’m sick as a dog right now. Although I have no idea why that saying makes any sense. 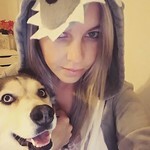 Are dogs notoriously sick? It boggles the mind. I am digging this apple recipe. It makes me want to run into the kitchen right now. Sadly I can only meander right now so it might wait a week. The photos are spectacular. And I shouldn’t admit to this, but I hate pumpkin. I know right. I should be kicked out of the foodie community immediately. Are you even kidding me?!! I can’t believe she jumped out of the window! I would’ve FLIPPED out!! This looks so easy and delicios! I love it!!! I think you need to douse the hubs in purel when he walks in the door!! This is the perfect way to welcome fall!! Love Caramel Apples but in a warm and gooey crumble?! Yes please!! Loving your site! 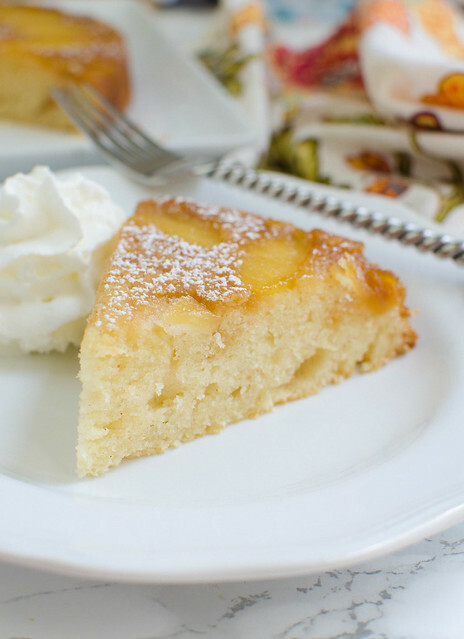 Yum – getting close to fall and this dessert looks perfect for this time of year! This looks amazing. It is in my crock pot right now. I changed a few things: I added a cup of blueberries and to the topping added a scoop of vanilla protein. In place of the butter I I used coconut oil. Smells great. Thank you for the recipe. I would imagine many varieties of apples would work….but which ones would you recommend? This looks wonderful. Can’t wait to make it. Thank you for sharing. I make an apple pie with equal amounts of Granny Smith and Braeburn apples. I’m not sure if I missed it or not, but what size crockpot do you need to do this in. I want to make this sometime this week. It looks really delicious. Thanks for the great recipe. I use a small one – like a 4 quart or something close to that. Did you peel the apples? I made this yesterday to take to a dinner party and it was a hit! Thanks for the recipe. It was easy and delicious! I have a dumb question. where does the Carmel come into play?? Or do the ingredients mixed taste like Carmel? Where does the caramel come into play in this recipe? This is the best apple crumble ever. The aroma is delicious but the taste is incredible. Thank you for our new favorite Fall recipe. Should I use quick oats or old fashioned oats? made this for thanksgiving and everyone freaked out over it. Used the leftovers for breakfast by putting it over a fresh bowl of hot oatmeal. Might make another batch minus the oats for breakfast purposes again sometime. Can I use apple filling instead of apples? That’s what I have in my pantry. Made this and it was but found it way to sweet the first time I made. Second time I made it I cut the sugar back by 1/2 a cup and added more oats. Much better second time around. Easy peasy recipe. Thank you. Loved this!! The only thing I had a problem with is it was to juicy, it didn’t thicken! I followed the recipe to a t. I was thinking of adding some cornstarch to the apple mixture to see if that would help. Any other suggestions that may help? I cooked it with the lid on my Crock-Pot and it was really soupy. Took the lid off and cooked it another couple of hours and it was perfect. Might want to make that a note on this recipe. What you can also do is spread paper towels over the top of the crock pot before putting the lid on. The paper towels will catch the condensation that forms, leaving.the crisp nice and non-soggy. I make this @ least once a month!! Best recipe ever!!! I even use 2 large cans of peaches instead of apples & it is to die for!! What size crock pot are you using. The original round one or the larger oval. It says to use 5 large apples. Can someone please tell me approximately how many cups that is? I have a bag of small apples and am wondering how many of them I should use.